This article will address lesions in the eye area, which are a common complaint. These can look similar to each other and be unrecognizable by skin care professionals, but improper treatment of eye lesions can do more harm than good. This article will go through the most common lesions seen around the eyes—milia, syringomas and xanthelasma—discussing how to address them or when to send your client to a medical professional. 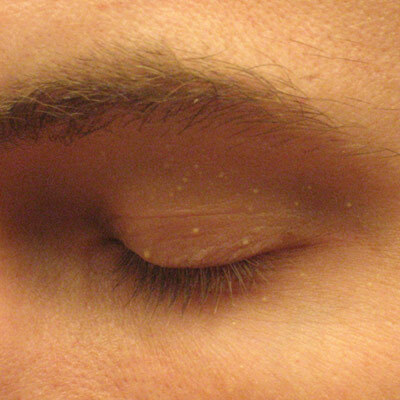 Milia are small, white, round lesions commonly seen around the eyes. They are formed by an accumulation of dead cells on the surface of the skin that block sebum. Milia can be identified by their pearly appearance and distinguished round border. They are most often associated with a thickened epidermis, which can be caused by specific skin conditions including sun damage, although they can occur in anyone. Cause. Due to the thinner, delicate skin around the eyes and lack of sebaceous activity, skin care products for the eye area often are more emollient than those used for other skin areas. These occlusive agents can inhibit the shedding of cells, which can create thickened skin and lead to milia. Ask clients with milia if they have recently switched eye care or eye cosmetic products. Milia accumulation also is a common problem in those who undergo ablative laser resurfacing or medium to deep chemical peels, as the skin must be protected diligently with an occlusive agent to allow for healing. Treatment. Regardless of the cause, these lesions can easily be removed with a lancet by a medical professional or by licensed estheticians in specific states where it is allowed. Lancets are thin, sterile, single-use needles that are used to create a small opening in the skin. In this case, they create a space for the hardened sebum to be removed without damaging the surrounding tissue. Although lancing is effective, it must be performed correctly and carefully, especially in the eye area where scarring could occur. Exfoliation also is helpful for recurring milia but only with products designed for the eye area. Physicians may even perform chemical peels to break apart the dead skin and help prevent new milia from forming. Retinoids are great for milia on other areas of the face to stimulate healthy cell removal and renewal. Unfortunately, they cannot be used on the eyelids or too close to the eye. If there are several recurring milia, a physician may opt to treat more aggressively with a resurfacing laser. Resurfacing lasers create heat to remove layers of skin, allowing for the thorough removal of lesions and built-up dead skin. Syringomas are small, skin-colored or yellow papules typically seen in clusters around the eye area. They are present in other areas of the body as well, but this article will focus on syringomas around the eyes. Cause. Syringomas stem from eccrine glands, small sweat glands present on the entire body that protect the body from heat. At the top of eccrine glands are ducts or openings, where sweat is released. When the eccrine ducts are enlarged beneath the superficial layers of skin, they can create small, 1-3 mm, visible and raised skin lesions. Syringomas differ from milia in their color and uneven border; their shape may look like small tear drops. Syringomas are common and are considered benign tumors—and while the term tumor seems scary, it is simply used to describe an abnormal tissue growth. Syringomas are more common in women and typically cause no problems besides concerns over their cosmetic appearance. Treatment. Estheticians should not try to remove syringomas; instead, they should refer the client to a trusted physician. There are several treatments the physician can use to remove these lesions, and some are better than others. Excision is the oldest method of removal, where the physician surgically removes each syringoma with a scalpel. The downside of this procedure is the risk of scarring. Electrodesiccation is used to remove several dermatologic lesions by burning the area with an electric current. This may take several treatments but is worth the extra time for reduced risk of complications. Cryotherapy, commonly known as “freezing,” is a preferred method to some, but it can be risky if the lesions are too close to the eye. Chemical peels also have been used, but caution is taken seriously due to the thin nature of the skin around the eyes. In the past, it was common to see practitioners ablating, or removing, the lesions with traditional CO2 lasers or dermabrasion. These invasive treatments did the job but had a higher risk of side effects including pigment changes and scarring. More recently, fractionated CO2 lasers, or lasers that only treat portions of an area, are being used with great success and less downtime than traditional ablative procedures. With any of these methods, there is no guarantee the lesions will not return, which the patient must know before any procedure. The use of mild exfoliating agents such as alpha hydroxy acids can be used on a regular basis to prevent more lesions from forming, but the product must be labeled as safe for the eye area. Xanthelasma (or Xanthelasma palpebrarum) is yet another condition that commonly occurs around the eyes. It can be mistaken for acne, syringomas or milia. Cause. The yellow plaques of xanthelasma are caused by a build-up of certain fats under the skin, typically starting small and growing in size. These lesions often are referred to as cholesterol deposits since they can relate to a lipid disorder involving abnormal cholesterol levels. 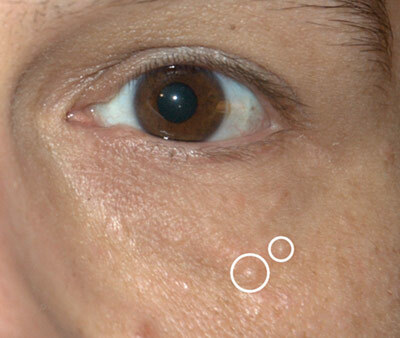 Xanthelasma, like milia and syringomas, typically is removed for cosmetic reasons. However, when it occurs near the inner canthus (corner) of the eye, larger lesions can inhibit one’s vision. Treatment. Those with xanthelasma should also be referred to a physician, not only for removal, but to have their lipid levels checked. Treatments for xanthelasma are similar to those for the removal of syringomas, including surgery, electrodessication, cryotherapy and chemical peels using trichloroacetic acid (TCA). And just as these treatments can cause complications with syringomas, they pose the same risks with xanthelasma. Skin conditions often are hard to identify, even by physicians. So, it is of utmost importance to make sure clients get the proper care, and it never hurts to get a second opinion. I have seen several posts online asking about bumps surrounding the eye, and I often see the response, “It’s probably a milia. Lance it.” I hope this article makes these conditions more clear and gives you and your clients a better understanding of where these bumps around the eyes come from. Terri A. Wojak, a licensed esthetician of 20 years, is an authority on skin care in a medical setting, education and business. She is director and educator at True U Esthetics, co-author of Mastering Medical Esthetics and author of Aesthetics Exposed: Mastering Skin Care In A Medical Setting and Beyond. 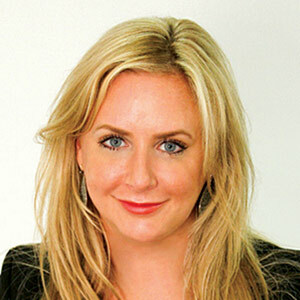 She is also a member of the Skin Inc. Editorial Advisory Board.